Killer Characters: Pets. Yeah or Nah? Not that I don’t love my profession, but the end of the school year is a tough time in public education. The both the kids and the staff are antsy and there’s pressure to wrap up everything on a high note. Which is why I decided to try an innovating new counseling technique, pet therapy, with my socially awkward third and fourth grade boys group. Luckily, the elementary principal stood up to the jerk and he wasn’t able to pull the plug on the pet therapy. Unluckily, he was dating the teacher of some of the kids in my group. Worse yet, he’s gunning for my godfather, Charlie Patukas’ position as school board president. Which means, I’ll reign in my inclination to smack this guy in the nose and avoid him as much as possible. After all, as long as no one gets murdered, I guess the rest doesn’t matter. Just keep your fingers crossed for me that no bodies turn up. I am not in the mood to be investigating a murder. 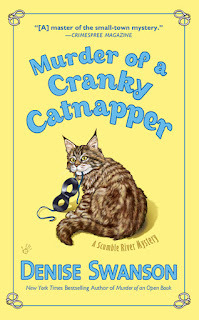 I am eagerly looking forward to reading the new Scrumble River book, Murder of a Cranky Catnapper! I have enjoyed this series since the first book. Love Skye Dennison's activities and antics. Where I work, which is a mental health facility, we added pet therapy, 2-3 yrs ago. It has done wonders for the patients and the staff! Dianne, I love that your facility has pet therapy! Love the Scrumble river series. You have to love when a character says, "As long as no one gets murdered..." LOL I'm betting she doesn't get her wish. Sounds like a fun story and the idea of pet therapy is great! I love the Stumble River series. Pet definitely are the best! Yay! Yes to the pets! I love pet therapy and the dog reading programs.